In January 2014 Washington and New Delhi were locked in a bitter diplomatic row over an Indian diplomat’s alleged exploitation of her housekeeper that ultimately saw the resignation of the US ambassador to India. 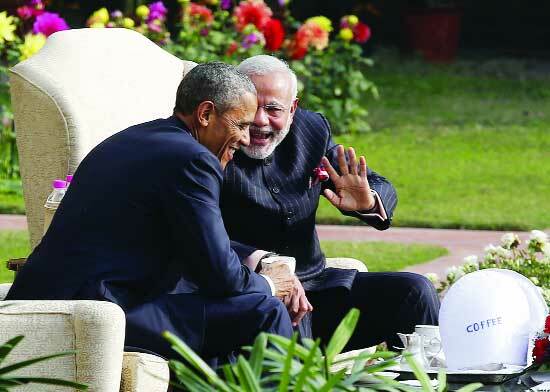 This cold relationship between India and US has been going on for the last one decade. But the bold decision by Narendra Modi, India’s new prime minister, to have the American president accompany him in the reviewing stand suggests that not only has he overcome his past differences with the United States but the idea that Barack Obama would be the first American president to take the salute from Indian soldiers as the chief guest at India’s Republic Day. Why there relation is so much increasing recently and Barack Obama is invited chip guest in there Republic Day. At least some factors help explain the paradox of unprecedented progress and continuing disappointment in India–U.S. bilateral relations. On a number of key issues, such as trade, climate change, and aspects of foreign policy, the US and India have found themselves on the opposite sides of the debate. Without those issues there have more influence to bilateral relations with India–U.S. In the changing world these two countries are equally expressing interest to walk hand in hand to keep their influence in regional and international politics. This new dimension of India and US relationship demands a conscious scrutiny for the regional counterparts in South Asia. The most significant and notable part of US-India relationship is the mutual partnership in defense. Relationship orbits between these two countries based on their defense relationship. During the cold war India was not within US bloc instead it was more close to the Soviet bloc. After the collapse of Soviet Union there was a little change in the US-India relationship. After that, to a limited extent defense partnership evolved. In 2005 an agreement was signed between them for ten years for mutual cooperation in defense. But during the tenure of UPA in India the US-India relationship was not so smooth. Especially during the last part of UPA rule the relationship between US and India lowered severely. As a consequence of that India entered into some defense agreements with Russia. There was also an uncertainty regarding whether the previous agreement would be renewed or not. But UPA is no more in India’s power. Modi, in his election manifesto, promised to develop the India’s defense by modernizing the defense force and achieving the self-capacity in defense. As a part of that he increased 12 percent defense budget and foreign investment in defense industry from 23 percent to 49 percent. Modi is interested to replace the age old Russian defense system with modern high tech based defense system of US. During the visit of Modi to US in last September the renewal of defense agreement was a significant agenda. Therefore, a good potentiality emerged for US companies to invest in India’s defense industry. Arms/weapon business with India is very much lucrative for arms exporters for high returns of their investment. Recently a data was released by the Stockholm International Peace Research Institute (SIRP) under the heading ‘Trends in International Arms Transfers’, which compared the ranks and volume of transfer by the biggest exporters and importers of conventional weapons. According to the analysis, countries with the largest weapon imports mean they could not produce their own weapons due to the restrictions enforced by military treaties. In addition, the capacity to develop their own military equipment is limited except for China who is now starting to produce its own weapons and vehicle armors. India tops the list for the biggest weapon buyer in the world. The country’s arm imports were 109% higher than China. There was 59% increase in arm imports from 2008-2012 than in 2003-2007. India has improved its long-range military capabilities. Recently a new concept arose ineconomics, which is war economics. That implies “War is good for Business”. The major fact is involved in India & USA relationship, which is war economy, USA is thetop arms/weapons producers in the world and on the other hand India is the top arms/weapons buyer in the world. So India-USA relation is based on mere arms/weapons relations. A war economy is the set of contingencies undertaken by a modern state to mobilize its economy for war production. Philippe Le Billon, an American geographer, author and university professor, describes a war economy as a “system of producing, mobilizing and allocating resources to sustain the violence”. Despite several differences,U.S. and India possess some characteristics, for instance, both countries are aggressive in their foreign policy and both are interested to play significant role international politics. With this agreement US-India is no more buyer and seller relation rather relation for mutual development, mutual production. There has been a long blueprint of US to set their role in Asia, especially, when they will leave Afghanistan. Both Clinton and Gorge W. Bush had planned to initiate strategic relation with India. In 2001 when Atal Bihari Bajpai was the Prime Minster of India there was a notable progress in US-India relation and the defense agreement between them was signed during that tenure. In the last visit of Obama to India, several issues like Afghanistan war, Iran’s nuclear project, Iraq and Syria war, North Korea’s role and even China’s role in the South Chinese sea, and so on came to the front to define the future of US-India relationship. Regarding South Asia, there is a basic incongruence in US–India relations. These divisive issues included potential American mediation on the territorial dispute between India and Pakistan over Kashmir, the perception of Washington that India might be part of the problem in Afghanistan, and the deep American concerns about India’s attitudes toward Iran. Prudence on both sides and the political determination in both capitals to advance the bilateral relationship helped India and the United States avoid these pitfalls and effectively manage and reduce the bilateral differences. The second term of the Obama Administration offers possibilities to move from the management of differences to building enduring cooperation in Southwest Asia. China is the biggest concern for US in the international and Asian politics. The rise of China definitely indicates that in future US will lose its influence over the Asia. Already Chinese initiative to launch the Asian Infrastructure Bank has threatened the west monopoly over the Asian Trade and Politics. US want a regional power parallel to China to decrease China’s sole influence over this region. US tie with India also will benefit it to negotiate with China on various issues in Asian region. India also greatly interested to supersede China in order to gaining regional influence. By moving ever more tightly into Washington’s strategic orbit, the Indian bourgeoisie is assisting and encouraging US imperialism in its reckless and ruinous offensive against China—which is considered as opponent of both India and China. It is also creating conditions in which the reactionary Indo-Pakistani military-strategic conflict, which is rooted in the communal partition of the subcontinent, becomes ever more entangled with the US-China divide, adding an explosive new dimension to each. In US-India relations the question involves also their relations with Pakistan and Myanmar. US relation with Pakistan is limited to force Pakistan to fight against terrorism but US knows Pakistan has more influence on Afghanistan than India. For that reason it will continue its strategic relation with Pakistan also. Both countries seemed equal footing to work altogether to maintain their relations with Myanmar and Sri Lanka on the basis of common interest. But most optimistic side of this US-India relation for South Asian regional politics is that during the tenure of UPA it was said by the South bloc bureaucrats that the neighboring countries will be seen to US through the eyeglasses of India. US suffered substantial loss for that attitude of India. Modi seemed his interest to move from EYEGLASS policy of India. The United States would like to deepen its commercial ties with India. However, the two sides have been actively locked in a trade dispute over access to the Indian market for agricultural imports that nearly brought down the Doha round of trade negations in the World Trade Organization. In addition, k negotiations formally launched in November 2012. The US will not have a seat in the RCEP for the foreseeable future due to the political differences and economic mismatch with some of ASEAN’s less-developed members. Both RCEP and TPP have been formally identified by APEC as building blocks toward the long-term goal of a free trade area of the Asia–Pacific (FTAAP). Membership in APEC will be a requirement for inclusion in that agreement. Furthermore, APEC standards will only grow in importance as that long-term vision comes into view. India should be both a contributor to those standards and stakeholder in them. US want to increase its influence over ASEAN, APEC through the good relation with India. India–US cooperation in counterterrorism increased significantly after 9/11. The US–India Cyber Security Forum was set up in 2002, but experienced setbacks that have dampened some of the enthusiasm for cooperating in this particular arena. The 2008 terrorist attacks in Mumbai and the extent of help sought and given by the US in the investigations, as well as diplomatic efforts by India, culminated in the Bilateral Counterterrorism Cooperation Agreement in 2010. Other joint initiatives include interactions between security and intelligence officials, exchange visits of senior leadership of security and intelligence units, joint training exercises, and U.S. assistance to India in enhancing critical investigation skills. The US-India new relation is a stepping stone for India to increase the cooperation in this sector. Since the end of the Cold War, the challenges facing the international nonproliferation regime have grown manifold. The threat of nuclear terrorism along with other regional challenges, such as the Iranian and North Korean nuclear programs, and Chinese engagement in proliferation to Pakistan, Iran, and North Korea, have added to the complexities. However, the biggest problem is the continuing crisis of the regime itself. Disagreement among major powers has resulted in the current status of the regime. After the defense agreement between US and India in 2005 an agreement regarding the nuclear was necessary to make the previous agreement operative. The India–United States Civil Nuclear Agreement, which is also referred to as the “123 Agreement”, signed on 10 October 2008 is a bilateral agreement for peaceful nuclear cooperation which governs civil nuclear trade between American and Indian firms to participate in each other’s civil nuclear energy sector. For the agreement to be operational, nuclear vendors and operators must comply with India’s 2010 Nuclear Liability Act which stipulates that nuclear suppliers, contractors and operators must bear financial responsibility in case of an accident. Economic exchange between countries involves goods, services, capital, labor, and knowledge. While India and the U.S. have enjoyed some success, the two countries still face serious challenges on all fronts.The U.S. can advance the relationship by returning to previous liberal policies concerning Indian services trade and labor movement. The reforms offered by the Indian government in autumn 2012 are a step forward in investment but India can do more, starting with partly removing trade and legal obstacles to American agriculture and pharmaceuticals. An excellent start would be for the US to liberalize its shale gas exports, so that India can fairly compete to be a recipient, in exchange for India liberalizing its poultry imports. Despite the successes in US–Indian counterterrorism cooperation, the true potential of this relationship remains unfulfilled. There are several reasons for this gap between expectations and achievement—some of them are historical, a few because of divergent perceptions, and the rest caused by structural mismatch. Indian policymakers, strategists, and analysts are unable to reconcile their perception of US policy on terrorism and its attitude toward Pakistan. Washington’s over-eagerness to accommodate Pakistani demands and perceptions accompanied by an inability or unwillingness to penalize Pakistan, despite the harsh reality of Pakistan’s continued support for terrorism, remains inexplicable to most Indians. This continued support by the U.S. has emboldened Pakistan to resist demands to dismantle its terrorist infrastructure. The US handling of the case of Pakistani-American David Headley, who conspired with Lashkar-e-Taiba(LeT) in the 2008 Mumbai attacks, also disappointed Indian counterterrorism professionals. The US reluctance to allow India free access to Headley only strengthened Indian doubts about US credibility in prosecuting terrorism cases linked to Pakistan. The alacrity with which Headley was allowed a plea bargain and the refusal to facilitate Indian investigation of his links to LeT and his role in the Mumbai attacks remain sore points in New Delhi. Finally, there is a mismatch in structure and capacity of Indian and US nodal agencies of cooperation. Capacity deficiencies, archaic methods of training, and poor instructors within the police force have made it difficult for India to raise a strong and capable security bulwark against terrorism. Indian institutions remain ill-equipped to make full use of cooperation from the US, which has led to less than optimal results from bilateral cooperation.